Honor has introduced the Honor 10i smartphone. It has a 6.21-inch Full HD+ water drop notch display powered by Kirin 710 processor with 4GB RAM and 128GB Storage. Dual SIM device runs on Android 9.0 (Pie) with EMUI 9.0. On Camera it has a 24-megapixel rear camera, 2-megapixel secondary camera for portrait shots, 8-megapixel 120° ultra wide-angle lens and 32-megapixel front camera with AI beautify features. Packed by a 3400mAh battery. 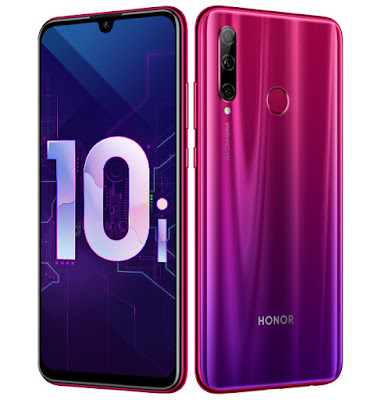 Honor 10i comes in Midnight Black, Gradient Blue, and Gradient Red colors No details about the pricing yet.